Internal Medicine and Critical Care of neonates, gastrointestinal disease, pneumonia, and neurologic conditions. Evaluation for poor performance—cardiovascular, respiratory and muscle disorders. Originally from Louisville, Kentucky, Dr. Hall graduated from North Carolina State University, College of Veterinary Medicine in 2006. After completing a rotating one-year internship, was accepted into a 3 year Medicine Residency at the University of California, Davis and earned her board certification as a specialist in Internal Medicine (Diplomate ACVIM) in 2010. She then moved to Texas to work for Brazos Valley Equine Hospital as a board-certified Internal Medicine Specialist. Since joining EMCO in January 2013, Dr. Hall successfully passed the American College of Veterinary Emergency and Critical Care boards. 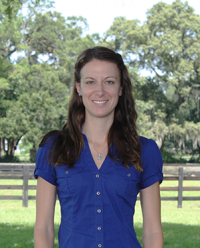 She is the only equine veterinarian in the State of Florida that is double boarded in Internal Medicine (Diplomate ACVIM) and Veterinary Emergency and Critical Care (Diplomate ACVECC). Dr. Hall enjoys traveling, cooking and spending time outdoors with her fiancé, Adam, and their three dogs.